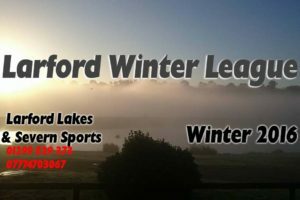 56 anglers fished the 3rd round of the Larford Winter League in freezing cold conditions. The ice had to be broken on the morning of the match so catches were certain to be low. Winner on the day was Max G (PR Floats) who drew peg 30 on the Specimen Lake. Max fished Method long to weigh 66-10-00. Rob weighed 55-00-00 on pole & Method. 3rd on the day was Neil McKinnon (Preston) who drew peg 76 on the Specimen Lake. 4th placed Warren Jennings (Bagem) drew peg 36 on the Match Lake and caught carp and bream to method weighing 37-06-00. 5th on the day was Martin Harrell (Larford) who drew peg 48 on the Match lake weighing 36-11-00 to Method feeder. 6th placed Chris Senter (Alans Tackle) who drew peg 46 on the Match Lake weighing 35-09-00 to the Method.